Dragi: If we see the picture how Nrisimhadev is killing Hiranyakashipu, we see that all the requirements are actually fulfilled. Swami Tirtha: Yes, yes. That part of the story will come later. This is because the blessings of such a nice servant of the Supreme Lord as Brahma should be fulfilled. God protects His devotees and the dignity of His devotees. If a devotee says: “It is like this!” it will happen, because the Supreme Lord is supporting him. But no human intelligence is enough to avoid the divine providence. Question of Kripadham: In the story it was mentioned that the demigods were worried, because they knew from before what Hiranyakashipu will ask. In the same way I suppose Brahma also knew his inner desire. 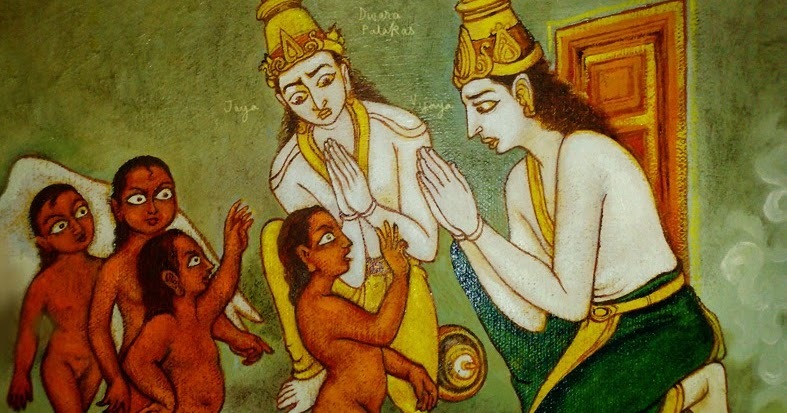 As he is a devotee of Vishnu, why did he give this boon? Swami Tirtha: Why not? You are a father. You know when your big son thinks something to do, you see the results and you see the intention. Yet you let him do it. Kripadham: Sometimes yes, sometimes no. Swami Tirtha: This time it was yes. But don’t forget that nothing happens by chance in the story. Without going through all the tapasya and all the power, Hiranyakashipu could not get rid of this conditioning. Because he had to be liberated. He was not a simple opponent of God, he was put into this position with some purpose. Just like Judas. Many people think that he was the betrayer of Jesus. And this is true. Very difficult role. But actually without Judas there is no crucifixion and there is no resurrection. So he is a very necessary part of this very grand, very serious story. In the same way in our stories when there are some opponents of the divine plan, they are necessary parts. Without them it cannot really happen. Question of Yashoda: It is said that when God personally kills somebody, it’s the greatest blessing and he doesn’t have to take birth again in this world. As far as I know about Hiranyakashipu and Hiranyaksha – this is their first birth in this world, after that there are two more. How to explain this? Swami Tirtha: Well, they had a deal. Originally Hiranyakashipu and Hiranyaksha, these great demoniac brothers were servants in heaven. But they made a little mistake. As we read, they did not let the Kumaras, the saintly sons of Brahma enter. So they cursed them: “Such a mentality has no place here on the heavenly planet, so you have to take birth on the planet Earth.” Even Vishnu came, because this was a big scandal: “Hey! What’s happening in My kingdom? What is this big noise?” Then everything was told to Him: “They’ve made this mistake and now the curse is done. The four Kumaras are Brahmins; the word of a brahmin should always fulfill, so what can be done?” Jay and Vijay prayed: “Please, can You nullify this curse?” But then the Supreme Lord said: “How can I change the word of My devotee? If they had given that curse, it should happen. I cannot avoid that. But maybe I can give You a chance. Anyway you have to take birth on the material platform, but you can take birth twelve times as devotees or three times as demons. Choose!” They had to make a choice. They were quickly calculating: “Three as demons. It’s faster. And then we can come back to our original position of serving You.” This was the final – so that these brothers should find their way back home, back to Godhead. Therefore in this story, later on, when they were bound to take birth as these demoniac powers, they had no choice. They were under this negative, sinful influence. But even that negative influence had a positive goal – to help them to come back.